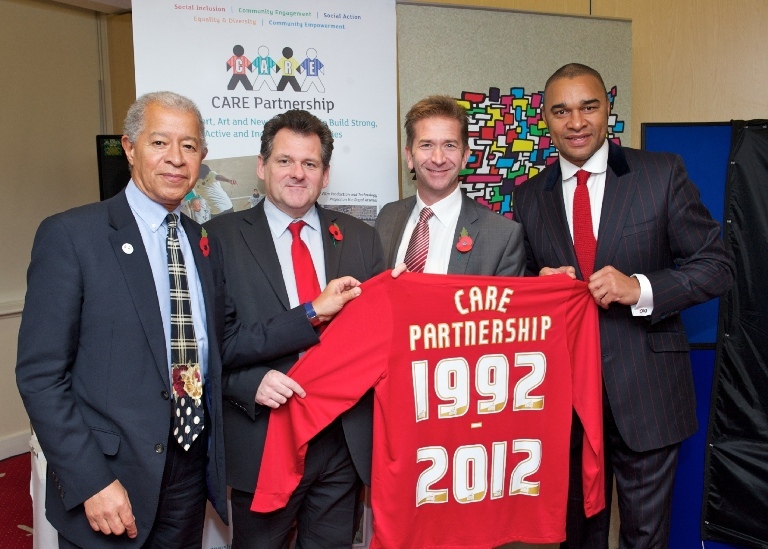 The Charlton Athletic Race & Equality (CARE) Partnership recently celebrated their 20th Anniversary. Pictured is Lord Heman Ouseley, Chair of Kick It Out, alongside representatives from CARE's lead partners: The Leader of the Royal Borough of Greenwich, Cllr Chris Roberts; the Chairman of CAFC, Michael Slater; and CARE Ambassador, Paul Elliott CBE. CARE is the only project of its kind in Europe to be lead by a local authority and a professional football club. The partnership has allowed for two decade's of campaigning for equality and anti-discrimination. Chris Powell, CAFC Manager, is a member of Show Racism the Red Card's Hall of Fame for his commitment to anti-racism. He said of CARE: “We’ve led the way in campaigning for equal rights for all and promoting diversity among people of all backgrounds, and we’ve shown what should and can be done. Our commitment to tackling these issues is part of the fabric of this club, and long may we continue to be a shining light in this area”. Ged Grebby, Chief Executive of Show Racism the Red Card, said, "I offer my sincere congratulations to CARE, celebrating two decades of their successful campaign. Show Racism the Red Card is proud to have the support of Charlton Athletic Football Club in our anti-racism initiatives and we look forward to building upon this relationship in future." Learn more about CARE in their CARE Partnership Brochure.